For frequent aquatic fitness classes, you need affordable, comfortable, and durable polyester swimwear with chlorine-resistant and fade-proof qualities that outlast conventional alternatives. Swimandsweat offers numerous high-neck, long-torso, tankini, one-piece, and mastectomy styles featuring popular solid shades or trendy color blocking in sizes 8-26WD. Search for textured Krinkle® bathing suits to wear during water aerobics. Or, browse innovative Dolfin AquaShape™ swimsuits to glide easily and achieve maximum water aerobics benefits. During pool workouts, your body feels like it weighs around 90 percent less. Water supports your weight, so your aching joints and bones bear much lighter loads. That makes exercising easier on you, reducing your injury chances. Therefore, running and jumping in a pool diminishes the impacts those moves would create on land. 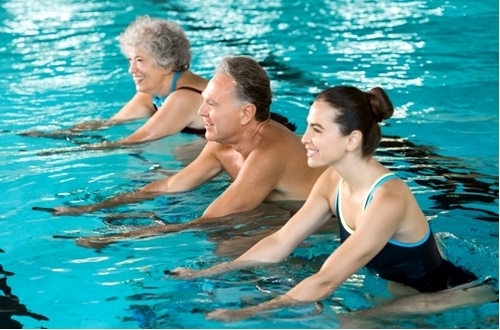 Low-impact aquatic aerobics are so gentle on joints, they’re ideal if you suffer from arthritis, fibromyalgia, back pain, knee conditions, or leg or foot problems or injuries. Water’s buoyant properties are naturally supportive enough to improve your joints’ range of motion and your overall movement range without extra stress. Your body can attain and hold some challenging positions that you’re unable to duplicate easily on land. Warm water is the most relaxing, so it reduces tightness and muscle spasms, enhancing flexibility more. Submersion up to your neck places more demands on your respiratory system, increasing exhalations. Your respiratory muscles must work harder, which tones them — even when you’re standing still. Stretching or lifting weights underwater involves water pressure against your body while blood moves into your chest. Those factors make you take quicker, shorter breaths. Because receiving air is challenging, your lung capacity improves over time. All workouts boost your heart rate, and water aerobics heighten cardio intensity. Your heart muscle needs conditioning and responds to it by increasing the amount it beats or contracts every minute. While that number increases, your heart works with your lungs to pump more oxygenated blood throughout your body, servicing your active muscles. Consistent cardiac exercises make your heart more efficient. Aquatic workouts with intensity elements like acceleration, inertia, and travel can elevate your heart rate and enhance its response. Water’s resistance and pressure work with your blood so it circulates throughout your body more effectively. That decreases your blood pressure while lowering your resting heart rate. Adults need to do moderately intense exercises 150 or more minutes weekly to sustain their health. As you build regular training into your routine and enjoy improved fitness, increase your intensity levels and physical activity times. 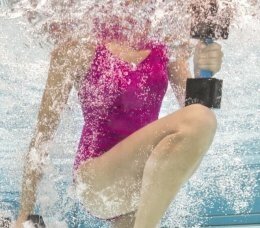 Moving through water’s natural resistance takes renewed effort, burning calories quickly for weight loss. Some people expend 400 to 500 calories every hour they participate in aquatic aerobics programs. Eliminating 500 extra calories daily corresponds to losing about one pound weekly. Factors determining your actual amount include your movements’ intensity, water depth and temperature, and your size. Faster arm and leg motions in greater depths use up the most calories typically. Heavier participants burn more than lighter ones. If you weigh 155 pounds, you’ll burn around 300 calories during each one-hour aquatic exercise class. But you can double that number to 600 if you weigh 240 pounds. Pool water is a fluid that stays in motion constantly, flowing in multiple directions while pressing against your body. You must work harder to combat water resistance. Moving your limbs through water and altering your course takes extra physical effort. Kicking water or pushing and pulling it with your cupped hands will develop muscles. Greater submersion requires more strength and energy to turn around and change activities. Classes featuring buoy, kickboard, noodle, and paddle equipment can generate further strength gains. Your body also will become healthier with a faster metabolism. Water surrounds and presses against your submerged body, creating constant 360-degree, 3-D resistance. Every movement you make requires exertion as you strain to maneuver through water. Shifting amid its strong opposing forces builds up your physical endurance.